As the title says I am going to explain how to debug AIR applications in Flash Builder 4 that are running on an Android device. Note: This is using AIR for Android prerelease off labs.adobe.com and the tooling and procedure to do on device debugging of AIR for Android with Flash Builder 4 will change in the future. Source code for this post as a Flash Builder 4 project called DebugDemo.fxp. Connect Android device to same network as desktop with Flash Builder, and lookup the desktop ip address. Compile application for debugging and android permissions of INTERNET (see note below), both mxmlc and adt. Put the debug version of the application on the Android device. 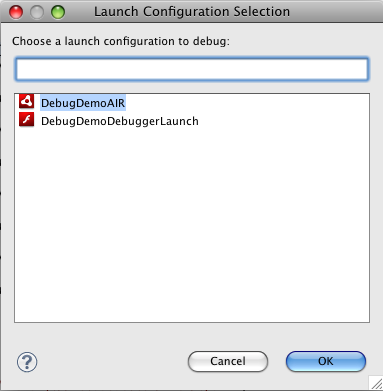 Configure the project in Flash Builder to launch debugger with out launching the Application. Launch AIR application on the Android device. (depends if you use correct value in -connect with adt) Enter IP of Flash Builder machine and click button. I first made sure that my Google Nexus One made by HTC was connected to my local wifi network. Then I retrieved my desktop’s ip address of value 192.168.1.100, which I’ll use in a second. There are various tools to do compiler and package your AIR applications for Android, but what I am showing is the lowest level options using mxmlc and adt. Both these tools are found in the Flex SDK, and more specifically with a Flex 4 SDK and AIR 2.5 SDK from the AIR for Android prerelease. If you are using Flash Professional CS5 the UI handles most of this for you, but you’ll still need the latest AIR for Android prerelease SDK. NOTE: The AIR runtimes support android permissions per application. That means you will need to set the correct android permissions in the android manifest area of the your AIR application descriptor file. You will need the android permission of <uses-permission android:name="android.permission.INTERNET"/>. 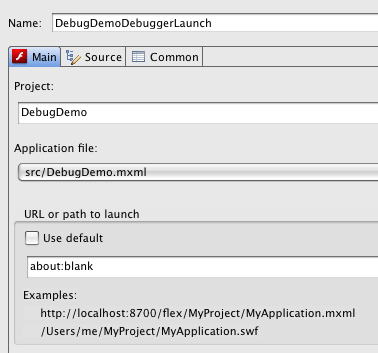 You will see an example AIR application descriptor file in the DebugDemo.fxp. You’ll note that it’s using “amxmlc”, which is just a wrapper around mxmlc with configuration files pointed to include AIR libraries. Now we have a debug version of the SWF file, onto packaging a debug version of the apk. The -target apk-debug -connect 192.168.1.102 are the critical parts. The -connect argument can take the form of a domain name, ip address, or “…”. The last options allows for you to set the IP address at runtime. You should be able to go onto your device and run the application. Force stop the application and then move on to the next steps to start the debug session in Flash Builder. Now the debugger will be launched from this configuration and will not load any SWF’s because about:blank goes nowhere. This puts the Flash Builder 4′s debugger in a state of waiting for a connection on the debugger port, note it will time out after some time. Go ahead and launch the new debug configuration item and it should ask to switch to the Flash Builder’s Debugger perspective. Switching to the debugger perspective shows the project waiting for a debug session connection. On Device Debugging AIR for Android with Flash Builder 4 from Renaun Erickson on Vimeo. Share the post "Debug AIR apps on Android with Flash Builder 4"
Hi, I’ve been trying to connect my nexus one to my pc. I compiled using the -connect IP_ADDRESS option, yet it asks me for the ip address / hostname. And it doesn’t accept any value I give, although it is connected to the same Wifi. I followed your steps but it doesn’t work for me. You might need to check firewall issues. The port that the Flash Debugger opens is 7935. I’ve updated my windows wireless inbound and outbound rules to allow eclipse (and the Flash Player Debugger for the SDK that I’m using – Flex 3.5) to connect with every port. I’ve even updated my router security settings to open up the 7935 TCP and UTP ports (which wouldn’t do anything because the communication between the host and device shouldn’t need to use the firewall of my router. But it doesn’t work I’ve posted this question on the Pre-release forums. Hmm.. that stinks not sure what the issue is. I would double check Flash Builder is in the waiting state. And then double check that the application is a debug SWF and packaged as apk-debug. Hi Mathius, this may seem obvious… make sure your android is connected to your local network through wifi (it needs it’s own IP on your network)… USB connection is only good for sending files over, and you will need a local network connection to debug. Thanks a lot for the article it also works for debuging on the android emulator. Polaco can you please tell how you make it work on emulator i am using window’s 7 not able to make it work on emulator i dont have device…. Any idea how to *reconnect* an app to the debugger (or vice versa) after a connection has been lost? 1. User opens the game. 2. User clicks a button to log in via Facebook. 3. The Facebook app is switched to momentarily so the user can enter their Facebook login and authenticate with the Facebook server. 3a. When the Facebook app appears, connection to the debugger is lost!